I have many fond memories of sewing as a child with my grandmother, while we chatted, laughed and enjoyed each other’s company. As an adult, I continue to sew and embroider. In the 1970s I painted canvases for a local needlework shop in Houston, took classes around the country, and eventually began to teach canvaswork (needlepoint). In 1980 I became an EGA Certified Teacher; thus began my 40 year profession. Recently I was asked “Do you still do needlepoint?” I responded in the affirmative and the next question was “Why?” This started me thinking — why, indeed, do I still do canvaswork when I now am a senior citizen with the usual arthritic aches and pains, especially in my hands. I find that stitching of any kind is a blessing to me — and it can be a blessing to others who are learning or are unsure of their ability. It provides companionship and an opportunity to meet people. Most people are inquisitive — how is it done, what are you making, and so on. Stories of a childhood with a mother or grandmother who stitched for or with them are interesting and make for great icebreakers at gatherings of all kinds. The sense of accomplishment in creating something that you enjoy is very special, and it need not be of museum quality. There are many interesting stitches you can use, not just the tent stitch we are all familiar with. There is always room for experimentation. 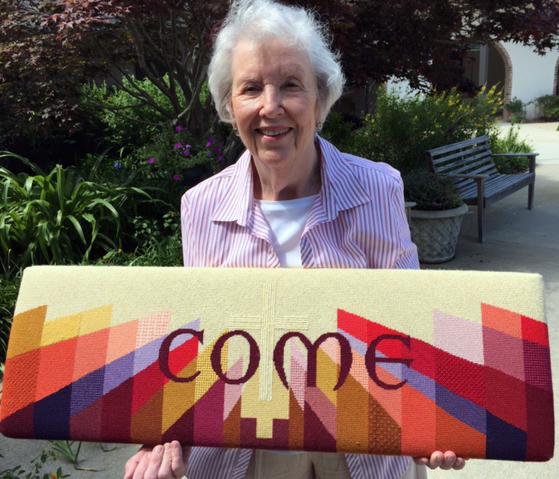 For me, stitching for the church is much more than just producing an item for the sanctuary. It is a blessing to use the talents given to you by God to create something beautiful or useful for our worship. It is an opportunity for reflection and meditation in the midst of the chaos of our fast paced lives. The necessary concentration on a particular stitch or technique frees your inner self to be open to listen to the Lord. It also provides a quiet moment where you can discuss those things that are troubling you with the Lord and sometimes see things with a different perspective. The sense of accomplishment in creating something that you enjoy is very special. It is not always easy to complete a project. As in life itself, there are times of frustration, even anger at yourself for making silly errors. The necessary ripping out (or reverse stitching) can be a learning experience in patience, and helps to keep us humble. We are but a small dot in God’s universe. 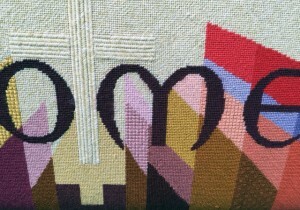 Discipline is another gift that needlepoint adds to our spiritual lives. You cannot complete a project if you do not commit to stitching. Perhaps you can only do two or three needlesful each day, but that is fine. Things are accomplished by perseverance, even in small steps. Stitching a little each day gives me time to calm my thoughts, reflect on God’s many blessings, and block out the distractions of my daily life. We need to use the talents that God has given us to His Glory. May we all find peace in our time of meditation with the needle and thread, and many hours of enjoyment in this creative endeavor. The pleasure I have known, Lord, in the skill you gave to me. Editor’s note: A long-time member of the Province IV Altar Guild, Sally designed and did the majority of the stitching on the orphrey bands for the altar of the Church of the Transfiguration at Kanuga Conference Center where she often shares her expertise with others teaching canvaswork at the Liturgical Arts Conference there.